The Carolina Colony, December, 1700. Lewis and Clark were a century in the future. John Bartram, eventually called the father of American botany, was in his cradle. North and South Carolina remained a single entity, mostly governed by Charles-Town, a port of 1200 residents. The Carolina interior? Mostly unknown to European settlers. Until a young man from London looking for adventure decided to take a walk. Some 314 years later, we followed in his footsteps. 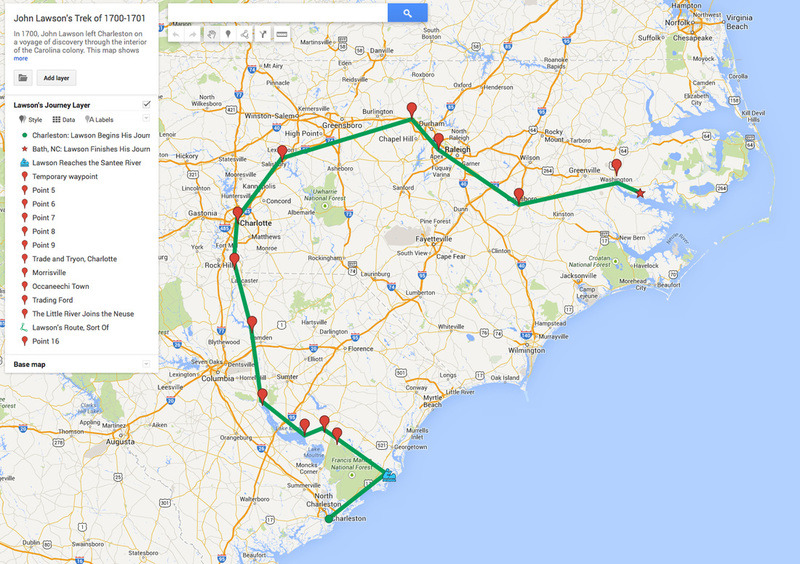 John Lawson's journey of 1700-1701 provided the first scientific descriptions of the Carolinas. His resulting book cataloged everything from flora and fauna to the native populations and their languages and practices. Considering "the Latitude and convenient Situation of Carolina," he wrote, "our Reason would inform us, that such a place lay fairly to be a delicious Country." Come with us -- writer Scott Huler and a changing cast of scientists, historians, and anybody else who wants to join in -- and learn how we retraced his trek through what is now a better known -- but still delicious -- country. Lawson's A New Voyage to Carolina came out nine years after his trek; that was the speed of communication in the early eighteenth century. The book was enormously popular and widely plagiarized -- in several languages. Something of a sales document -- as all documents of exploration tend to be -- it helped bring thousands of settlers to the colony. It also provided descriptions of the wildlife, flora, territory, and native populations of the colony that remain useful to this day. His descriptions of the Native American peoples he visited are some of the best remaining, and his descriptions of animals and plants help modern scientists -- to say nothing of historians and geographers and archaeologists -- get a thorough understanding of the Carolina colony, centuries after first contact (and its resulting catastrophic illnesses to the native populations) but before the rush of settlement. upcoming ​bookstore and media events. Quail Ridge Books, Raleigh. Reading and discussion with Tom Earnhardt, March 6, 7 pm. Blue Bicycle Books, Charleston, SC. Reading, March 8, 6 p.m.
McIntyre's Books, Pittsboro. Reading, March 16, 2 pm. Berry College, Rome, GA. Reading. March 18, TBA. Country Bookshop, Southern Pines. Reading. April 10, 5 pm. NC Museum of Natural Science. Science Cafe, April 11, 7 pm. Park Road Books, Charlotte. Reading, April 14, 2 pm. Scuppernong Books, Greensboro, April 17, 7 pm. So & So Books, Raleigh. May 19, TBA. ​Flyleaf Books, Chapel Hill. April 23, 7 pm, joint event with Holly FitzGerald, author of Ruthless River: Love and Survival by Raft on the Amazon’s Relentless Madre de Dios. Malaprop's, Asheville. Reading, 6 p.m., July 17. Grandfather Mountain. Lecture, July 18, 6:30 p.m.
Bookmark's, Winston-Salem. August 17, TBA. ​Events to come in Columbia, SC; at the Native American Studies Center in Lancaster, SC; at Books on Broad in Camden, SC; at the McClellanville (SC) Arts Council, and at the Fairfield County Museum in Winnsboro, SC. You can also check the events listing from my book page at UNC Press. ​Listen for the Lawson Trek soon on WPTF radio, on The State of Things on North Carolina Public Radio, on Rockingham County Radio, and on Walter Edgar's Journal. We updated you about our progress as we followed Lawson, by canoe and on foot, on road or path, through forest, swamp, town, city, and field. Click here to see the most recent updates. Our first trip began in mid-October, paddling by canoe from Charleston, SC -- just like Lawson did. Our second took place in the first days of 2015, walking through Francis Marion National Forest, and we walked on and off until our ceremonial finish in Bath, NC, in September 2015. Now the blog includes updates on the progress of A Delicious Country, a book you can now preorder from its publisher, UNC Press. Click here to learn all about it. Check the calendar at the bottom of this page for upcoming events. A young English gentleman looking for adventure, John Lawson in 1700 wanted to leave his mark on the world. His trek, book, and subsequent work in Carolina left an ineradicable mark not just on Carolina but on the history of science and exploration. A raccoon using its tail to fish for crabs. "... he lets his Tail hang in the Water. This the Crab takes for a Bait, and fastens his Claws therein, ... . " That is, Lawson believed some nutty stuff the locals told him.